A dedicated group of volunteers has been working overtime to assist OFC in making sure the tournament runs smoothly from the participating teams’ perspective as well as for the many fans who have turned up. So dedicated in fact, when Port Moresby came to a halt at reports of civil unrest on Wednesday 8 June, many of them still made their way to work to help the semi-finals go ahead. These volunteers have come to OFC via Papua New Guinea’s Urban Youth Employment Project (UYEP), a programme which aims to provide youth in the capital city the opportunity to gain income from temporary employment and on-the-job training to increase their employability. OFC Competitions Director Chris Kemp says without the involvement of the UYEP the tournament wouldn’t have run as smoothly as it did. 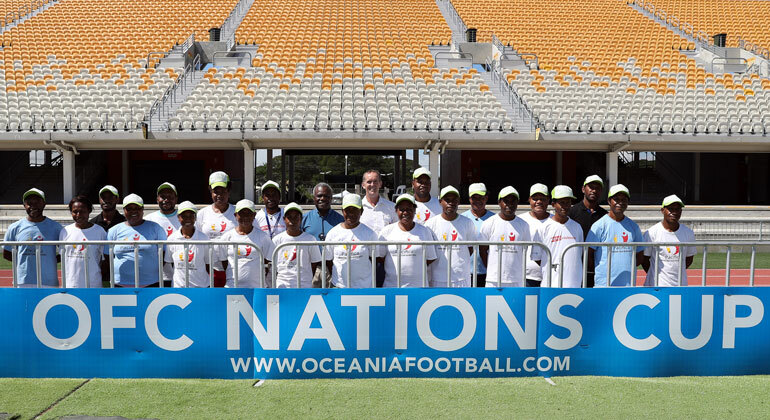 “The role of a volunteer in an event like the OFC Nations Cup is often overlooked, but it makes a huge difference to the success of the tournament,” Kemp says. The majority of those who have been involved come from disadvantaged backgrounds and went through a five-week intensive orientation to get them ready to assist with the Port Moresby-based competition. The involvement of UYEP in the OFC Nations Cup is courtesy of the National Capital District Commission (NCDC), a major supporter of OFC and its premier international tournament. OFC President David Chung says it has been a successful project which has provided benefit to both the OFC and the participating youth. “It is often difficult to find the manpower required to successfully run a regional competition and working with the UYEP, NCDC and Pacifica Limited on this project has made that task much easier,” he says. The UYEP involvement in the OFC Nations Cup is part of the legacy the tournament is leaving in Port Moresby, and the 200 youth involved have the potential opportunity to continue their growth at the FIFA U-20 Women’s World Cup later this year. Managing Director of Pacifica Limited David Newton says working with the UYEP workforce has been an absolute pleasure. “They have been so enthusiastic to learn and get involved in the event,” he says. “We have identified many of the team as showing team leader skills and they have taken on added responsibilities without question. This experience has become a key driver towards securing permanent employment in the near future. The UEYP volunteers will once again be out in force for the OFC Nations Cup final this afternoon as New Zealand take on the hosts Papua New Guinea at 4pm for the chance to be crowned Oceania champions.